The queen palm tree is a variety that grows up to 50 feet in height and produces up to 15 large leaves at its top. Queen palms are native to areas in South America and are hardy to plant in USDA growing zones 9 through 11 where the winters are mild. The tree does not tolerate temperatures below 25 degrees Fahrenheit. Select a planting location for the queen palm tree that has a sandy soil that drains quickly and full sunlight. The tree grows best in a sandy soil that has at least 10 percent to 20 percent peat or loam for nutrients and moisture retention. The tree will not grow in clay or wet soil as this will cause root and stem rot. Amend the soil by working in sand for drainage or peat moss for nutrients in a 6-foot radius around the planting area. 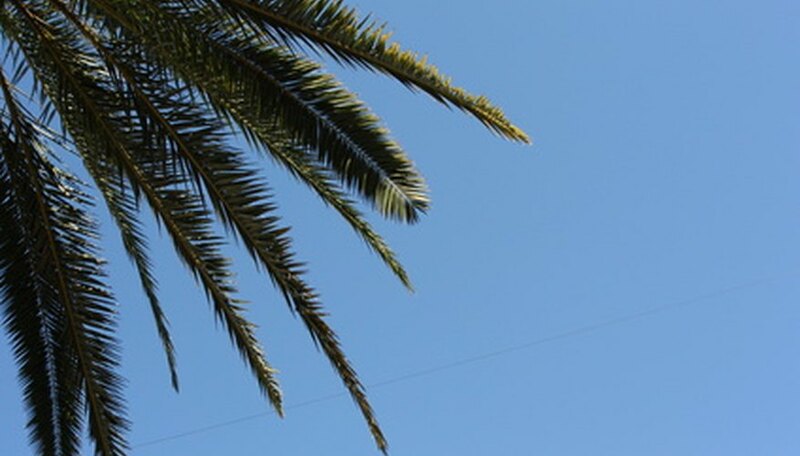 Do not plant queen palm trees near overhead power lines or next to buildings and paved roadways where the growth can be obstructed. Plant the queen palm by digging a hole that is 6 inches wider and slightly deeper than the container it came in. Fill the bottom of the hole with 2 to 4 inches of sand and set the tree on top making sure the root ball is at the same depth it was in the container. Mix the removed soil with equal portions of sand and blend in a triple phosphate fertilizer at a rate of 2 oz. per inch in diameter of the tree truck. Gently fill the soil around the root ball and pack in place to remove air pockets. Use the remaining soil to build a 2- to 3-inch berm around the base of the tree in a 3- to 4-foot diameter to hold water while it is being applied. Water the newly planted tree twice a week for the first six months of growth. Water the queen palm tree three times a week during the hot summer months. Make sure the water soaks deep into the soil to encourage deep root growth instead of shallow. Sandy soils will require more frequent water applications. Apply a 2- to 3-inch layer of mulch over the root ball of the tree to keep the roots moist and cool during the summer. Fertilize the queen palm four times a year with a slow release 12-4-12 or 13-3-13 palm fertilizer. Soak the fertilized area well after application. Do not prune palm trees as the wounds will not heal and will create a window for disease to enter the tree. Propagate your queen palm tree through the collection and planting of seeds. Purchase or collect seed from fully ripened fruit immediately after it has fallen from the tree. Soak the seeds in water for one to seven days making sure to change the water each day. Scar the seeds by carefully filing or cutting the seed until the endosperm is visible. Fill a planting tray or container with an even mixture of peat moss and perlite and plant the seed at a depth that matches the length of the seed. Place the containers in full sunlight during the germination process, which takes three to six months. Monitor the soil moisture so it does not dry out as this will damage the seeds and prevent germination. Monitor queen palm trees for a condition called frizzle top, which is caused by a manganese deficiency. New leaves will appear frizzled, stunted and black in color as they emerge from the tree. Treat the condition by applying powdered manganese sulfate over the root ball and watering well to stimulate absorption. Prevent a frizzled top problem with adequate fertilizer and water applications to keep the tree healthy.